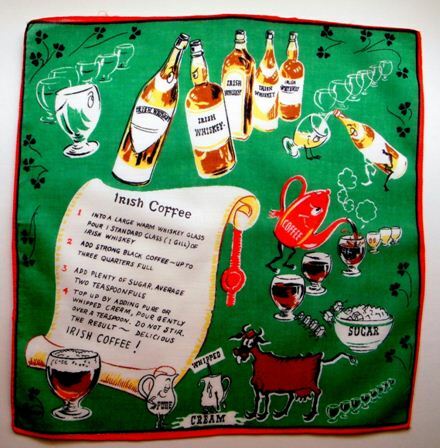 Faith and Begorrah, it seems anyone with a bit o’ blarney in him is eager to celebrate St. Patrick’s Day – and doesn’t that include most of us? 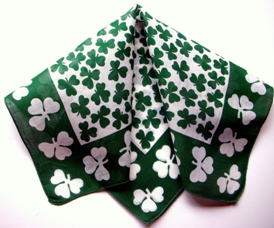 It’s doubtful you’ll find an Irishman on March 17th who doesn’t have a lucky shamrock tucked in his lapel. 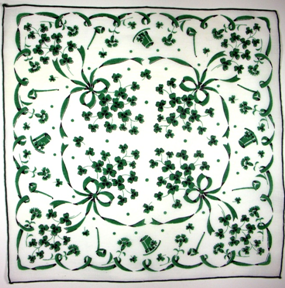 Why all the fuss about the lowly shamrock? 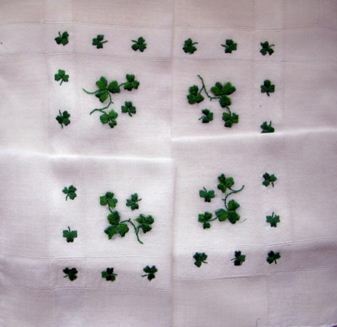 This simple three-leafed clover is known as a symbol of Ireland. 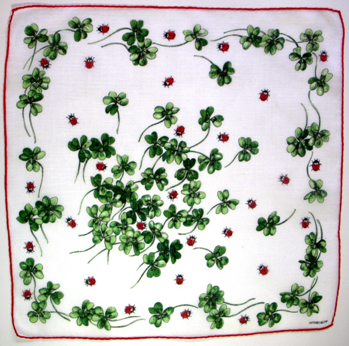 The name is derived from the Irish word seamróg, which means “little clover.” Legend has it that St. Patrick used the clover to illustrate the Christian doctrine of the Trinity – Father, Son and Holy Spirit. 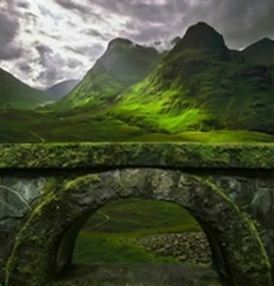 Since this legend didn’t surface until 1,200 years after St. Patrick died, some question the authenticity of the tale. 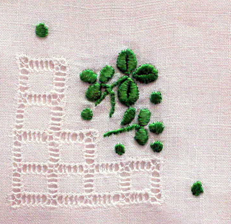 Regardless of its history, the deep green clover is a lovely image and makes a perfect subject for embroidery. If you’ve ever owned a shamrock plant, you know they close their petals and wee little flowers every evening to “sleep tight” through the night. 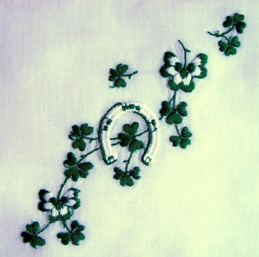 Reputed to have mystical powers, the shamrock’s petals have been known to stand upright to warn of an approaching storm. 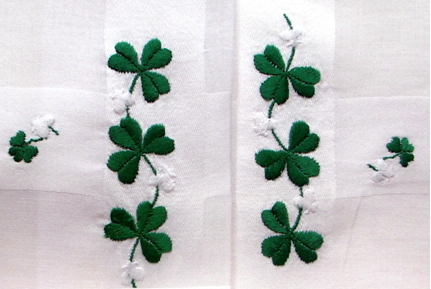 In Celtic lore, the shamrock was used as a charm to ward off evil, thus its reputation for “good luck” was born. 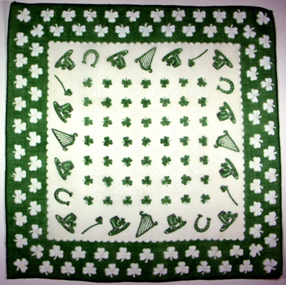 Shamrocks flow like green rivers over the hills, and provide a ubiquitous image for the classic linen handkerchief. There’s less to say, and more to see in the samples below. Simply allow yourself to get lost in the variety of images. 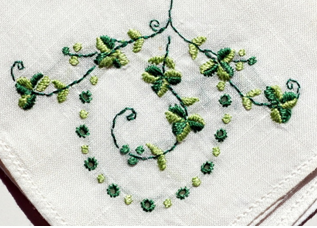 The soft and gentle lime and kelly green curls like a vine and anchors the corner of this crisp linen hankie. A perfect gift for Mother’s Day. 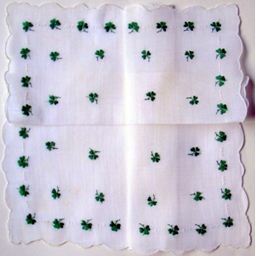 The second sweet little hankie is adorned with just a touch of embroidery offset by drawn work. 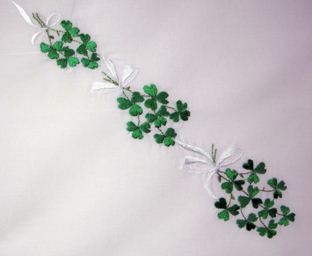 Shamrocks dance a jig round and round the lovely white border. There is something to be said for monochromatic imagery – subdued, sophisticated and elegant. 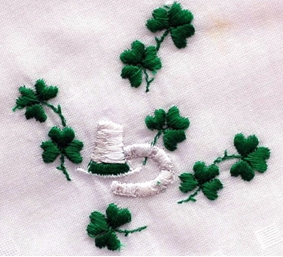 Look carefully for the wee white flowers nestled among the kelly green clover. I’m a sucker for those little flowers. We always had a shamrock plant for St. Patrick’s Day, so they remind me of my childhood. 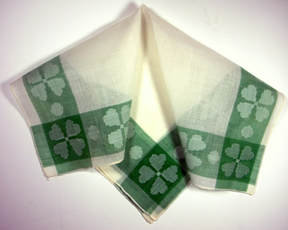 In addition to embroidery, several handkerchiefs have the images printed on or woven directly into the fabric. Some are soft and delicate…. What is an Irishman without his whiskey? Oops, I mean coffee, and here’s the recipe. 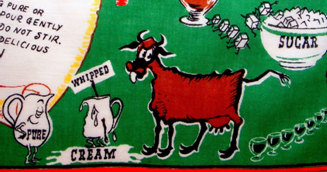 Lots of fun in this hankie, with sugar cubes marching off to their demise, and the whipped cream looking – well, whipped! After a few Irish coffees, little green men may start to appear. Wherever you find Irishmen, you’re sure to find shenanigans, and that includes Leprechauns. These sprites are solitary creatures, whose principal occupation is making shoes. According to Irish poet William Butler Yeats, because of their love of dancing, leprechauns constantly need new shoes. They’re also sprightly musicians, and play tin whistles, the fiddle, and the Irish Harp. Purportedly they have wild sessions at night known as Ceilis where people dance, sing and drink all night long. In fact, Yeats tells the story of a woman who was spirited away by leprechauns and returned seven years later minus her toes. She had danced them off!! Legend has it that leprechauns hide their coins in pot of gold which can be found at the end of a rainbow. If they’re ever captured, they have magical powers to grant three wishes in exchange for their release. 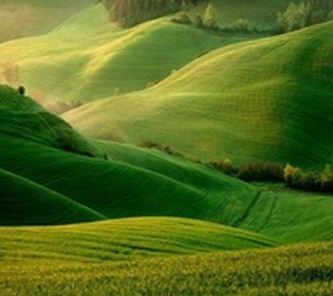 That’s why on St. Patrick’s Day, you’ll often see leprechaun traps set in Irish homes. 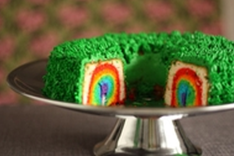 A rainbow cake to lure him in, bars to prevent his escape, and a drink to quench his thirst. 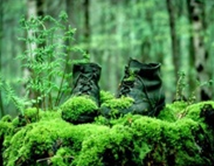 Those who do manage to trap a leprechaun often discover find that by the time they’re upon him, the naughty sprite has managed to slip through the snare,leaving only his wee boots behind. 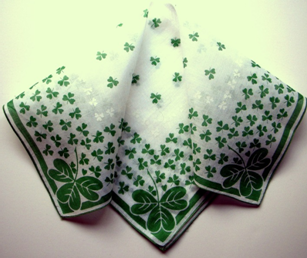 How is the wily green gremlin depicted on handkerchiefs? Just as you’d expect. He’s escaped again, leaving nothing behind but his buckled hat, or perhaps his pipe. Darn! There is often a horse shoe included, or even a ladybug for good luck, but the only one having luck is the little elf himself. Horseshoes, hats, and pipes abound, and don’t forget the lucky ladybug. 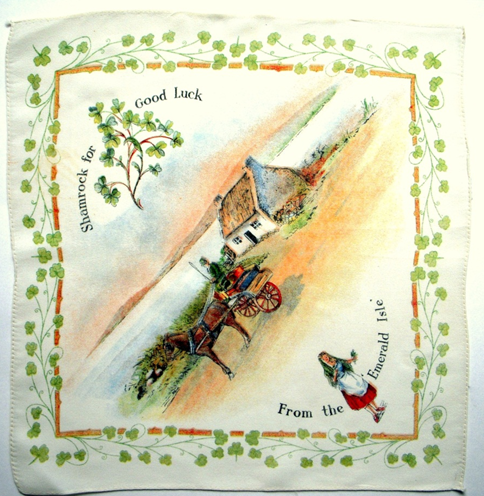 A silk souvenir depicts villagers in their native dress and habitat, surrounded by a border of good luck wishes. Look closely at the home in the background; typical of the simple single story cottages that dot the countryside. 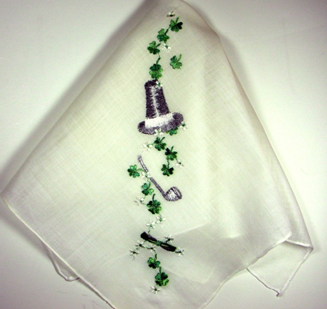 It’s one reason I so love this next embroidered hankie with its cozy cottage and winding shamrocks. 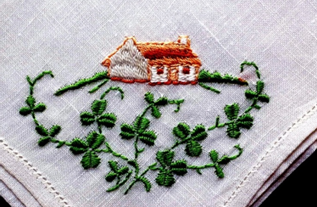 It reminded me of this simple home in Coolminga, County Clare, Ireland, where my great-grandfather was born. So much for dreams of castles. This is my ancestral home – a stone hut with a thatched roof! 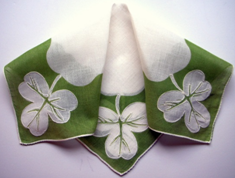 You can see why Ireland is called “the Emerald Isle” and why shamrocks abound on their linen handkerchiefs. You may have yet to see a leprechaun, but don’t lose heart. Whenever the sun comes out, there’s always a good chance for a rainbow, and as everyone knows, at the end of the rainbow lies his pot of gold. 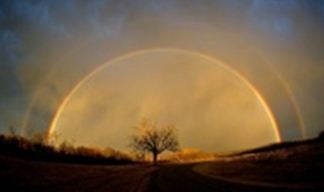 And if there’s a double rainbow, well Faith and Begorrah, you’ve been kissed by the luck o’ the Irish.